Our markets are changing. And we are changing with them. 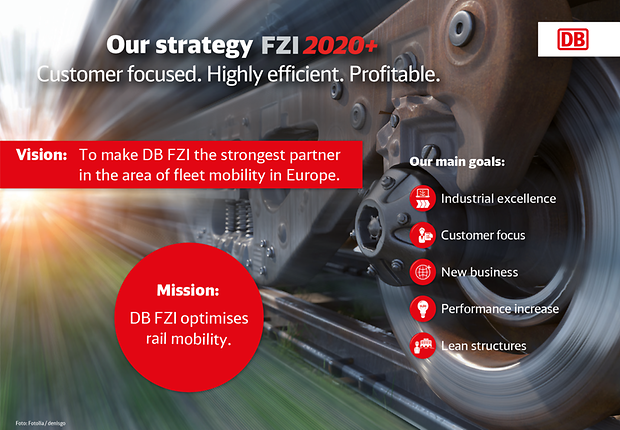 FZI2020+: We have a long-term, forward-looking and well-founded strategy in place to ensure that we are prepared for the future. Our vision is to be the strongest partner in the area of fleet mobility in Europe for our customers. We intend to achieve this by pursuing five main goals. We want to be a strong partner that not only maintains vehicles and their components across a European network, but also ensures that they remain operable by offering intelligent, interlinked solutions. Guaranteeing high availability of vehicles and components stands at the heart of our efforts. In other words, we have achieved our mission when our customers are moving passengers and goods by rail. DB Fahrzeuginstandhaltung is an engineering-centric company. Repairing rail vehicles and manufacturing their components is "in our genes". The way in which we work influences the engineering quality, time and cost. Our processes and systems are designed to make us the most modern and advanced engineering provider in the rail sector. With these and many other factors we achieve our goal of "industrial excellence". Our focus is on our customers' requirements. We are observing that the competitive pressure among our customers and their need for customised solutions and high vehicle availability are increasing, and that the focus is increasingly on vehicle operation only. This is why we are increasingly investing in the development of new products and services, offering more materials management products in the area of maintenance, for example obsolescence management, and expanding our full service solutions. Our goal is to be your first choice when it comes to finding a strong partner for fleet mobility. Thanks to our long-standing cooperation with our internal and external customers, we have a high level of expertise in many types of vehicles. We intend to strengthen and build on this expertise through strategic cooperation. Furthermore, by focusing on our marketing efforts and implementing our internationalisation strategy in collaboration with our customers and partners, we will add new products and tap into new markets. DB Fahrzeuginstandhaltung and the DB Group as a whole. We ensure the sustainability of our business by quickly responding to market developments. For example, we combine our engineering expertise in areas where it makes our products more appealing to our customers. We invest in the future viability of our company and strive to continue offering our customers high quality services. On Top: Our contribution to the protection of the environment. DB Fahrzeuginstandhaltung, we want to contribute to this strategy by establishing a resource-efficient production and developing demand-oriented products that reduce carbon emissions.